The Queen City of the South. An Island in the Pacific. A place where the heart sings. 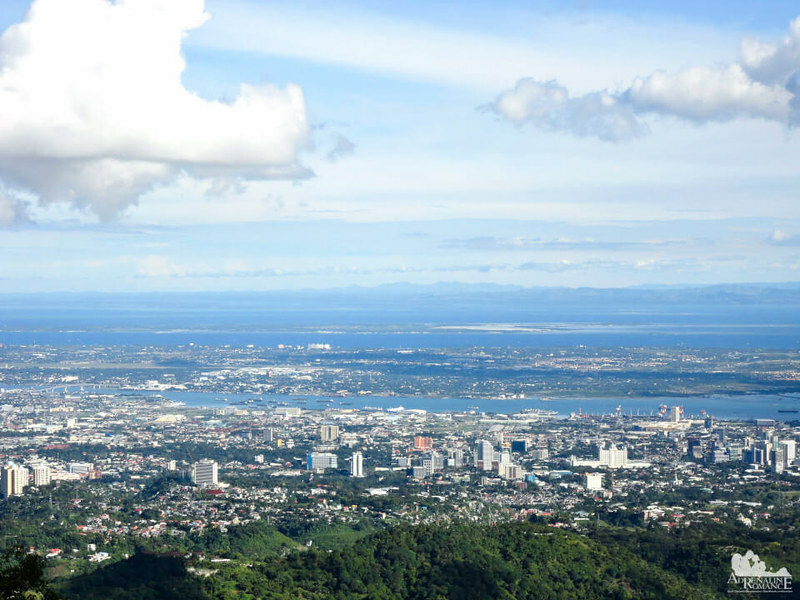 Our Cebu City is a jewel in the Philippines. As the country’s oldest city, it is rich in history, heritage, and culture that Cebuanos are proud of. 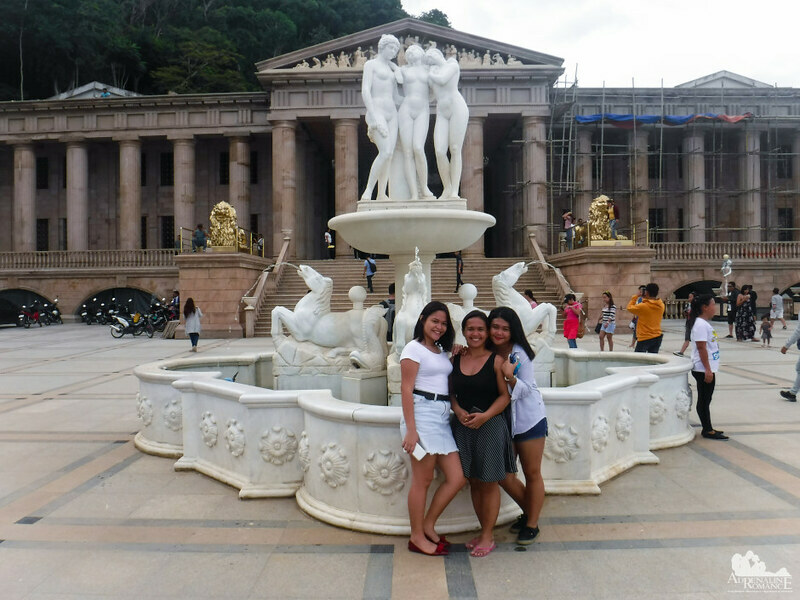 Thus, one weekend, Sweetie, together with our daughter Alexa and her cousin Ashley Faith, availed a cool Cebu tour package from Travel Cebu. We strapped on our Deuter backpack and proceeded to JCenter where we met our driver and guide. As we pulled off from our meeting place, we knew we were in for an exciting discovery of our Cebuano roots. Our first stop of the day was the Yap Sandiego Ancestral House at the edge of downtown Cebu. Made of tough coral stone blocks and dark molave wood, the well-preserved ancestral house stood proudly since the 17th century. The residence was originally owned by Don Juan Yap and Doña Maria Florido. 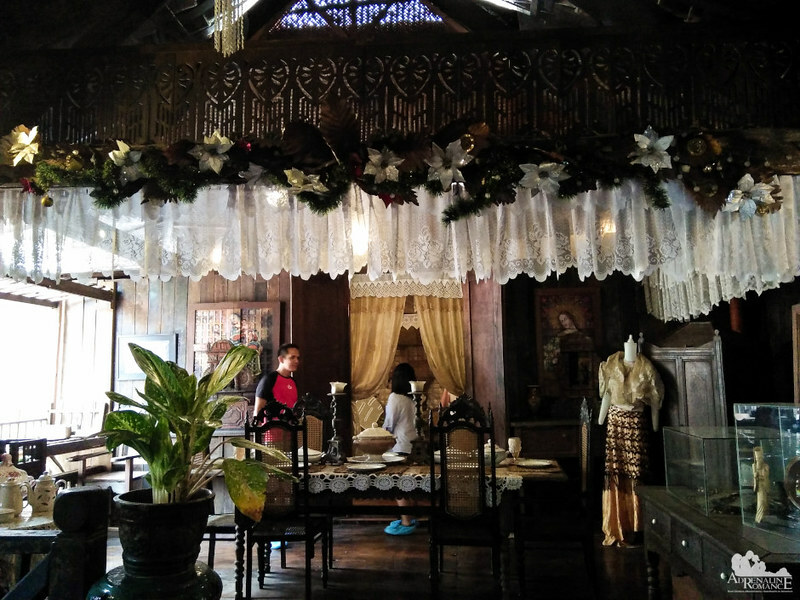 Then in 1880, their eldest daughter married Don Mariano Sandiego, and the house was entrusted under their care. Today, Val Sandiego, a well-respected Cebuano art collector and dance choreographer, takes care of the Yap Sandiego Ancestral House. We toured the entirety of the ancestral house. We saw rare relics and artifacts of Cebu. 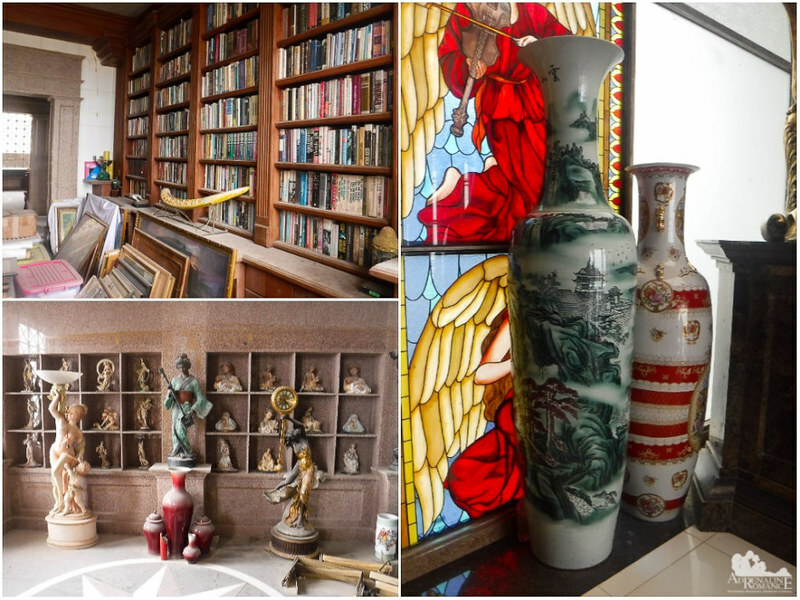 Religious statues, vases, decorations, furniture, and more are painstakingly preserved. They stand resplendent in their beauty as they did in their heydays. Indeed, it’s like walking back into the past. 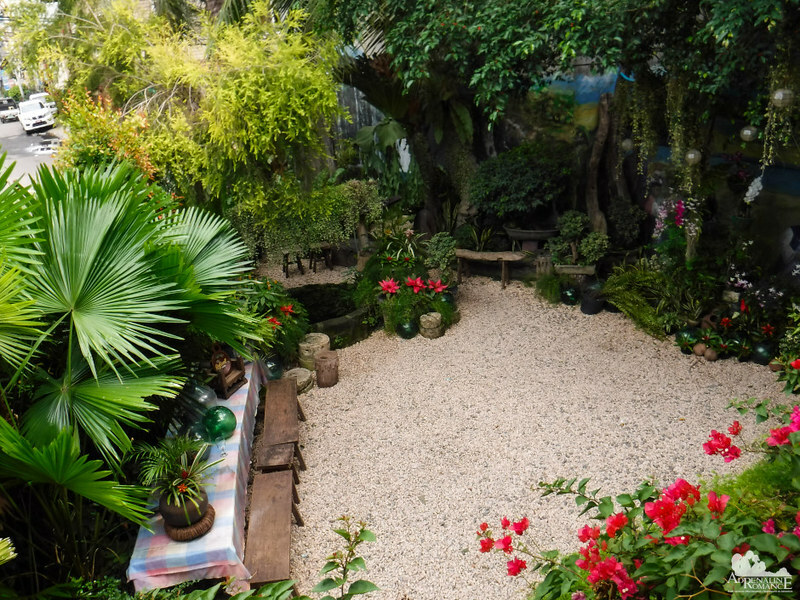 Outside the house is a small but nice Zen garden surrounded by ferns, bougainvilleas, and other plants that are indigenous in Cebu. Not visible in this photo is an old wooden dugout canoe that found a second life as a flower box. Val has received numerous offers to purchase the house and its belongings—from real estate developers to collectors. He refused to be swayed by any offer. He believes that this rich and ancient house is priceless—and so do we. 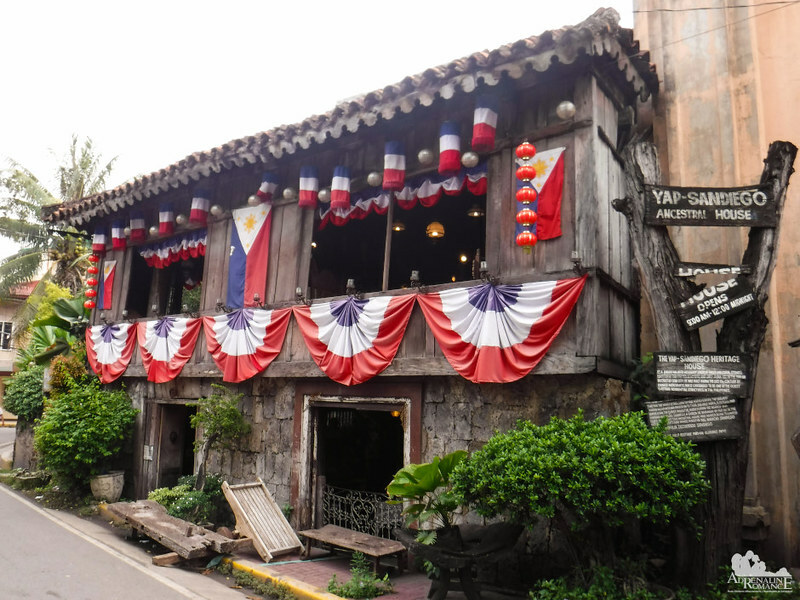 The Yap Sandiego Ancestral Home is a heritage, historical, and cultural icon of Cebu. 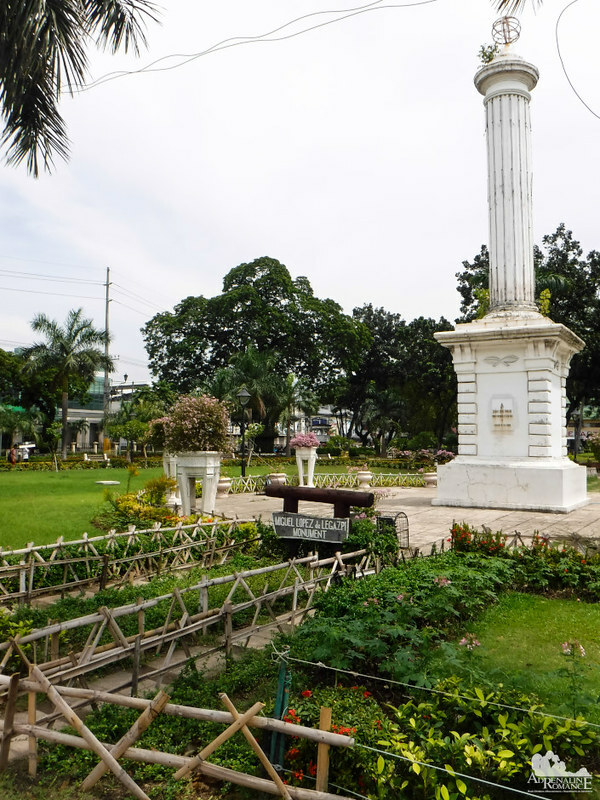 Just across the ancestral house is the massive Heritage of Cebu Monument. Located at the junction of three roads in the historic Parian District, it was built over the St. John the Baptist Church, which was demolished in 1875. 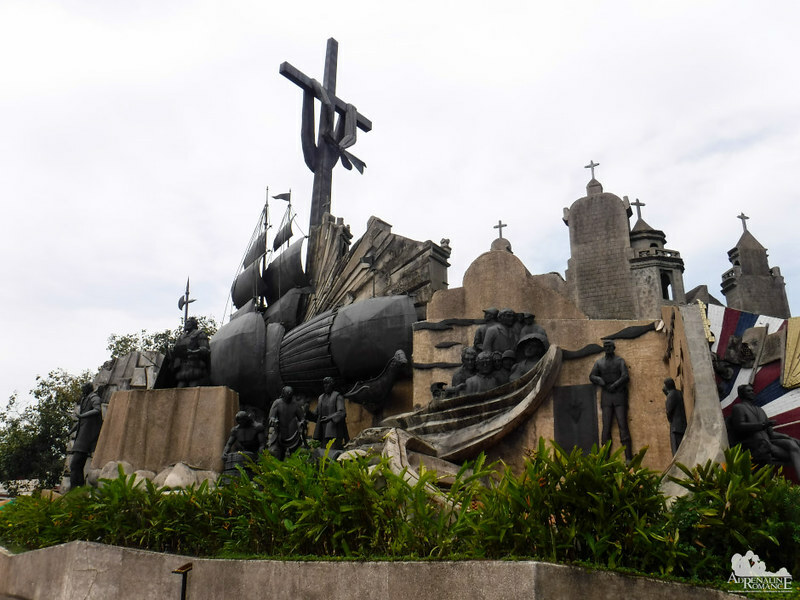 The Heritage of Cebu is a gigantic monument of concrete, steel, bronze, and brass. It is a collection of large sculptures that shows important events, structures, and scenes about the history and culture of Cebu. Eduardo Castrillo, a local Cebuano artist, started construction of the sculptures in 1997. The entire monument was completed three years after in December 2000. 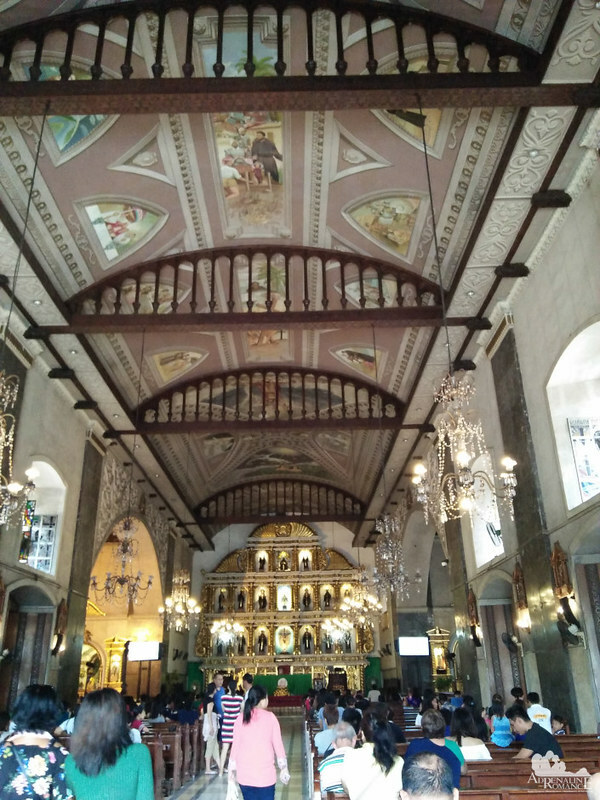 The next part of the tour was a visit to what is generally considered to be the very heart of Cebu. This is in the middle of Plaza Sugbo, recently inaugurated in 2008, in the middle of downtown Cebu. Long ago, this used to be a poblacion where Cebuanos of old gather to buy goods, deal with the local government, worship God, chat with friends, and more. 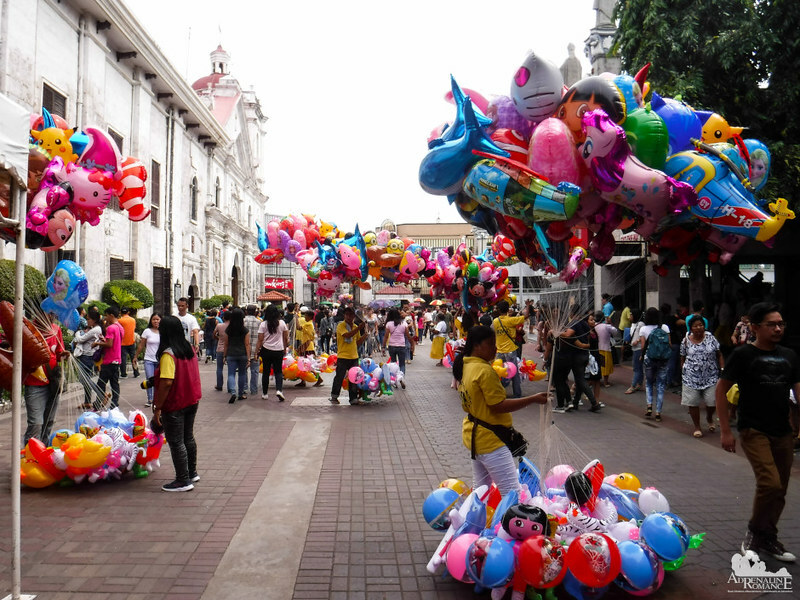 Today, Plaza Sugbo still holds that same purpose and charm albeit it has also become a popular tourist spot. 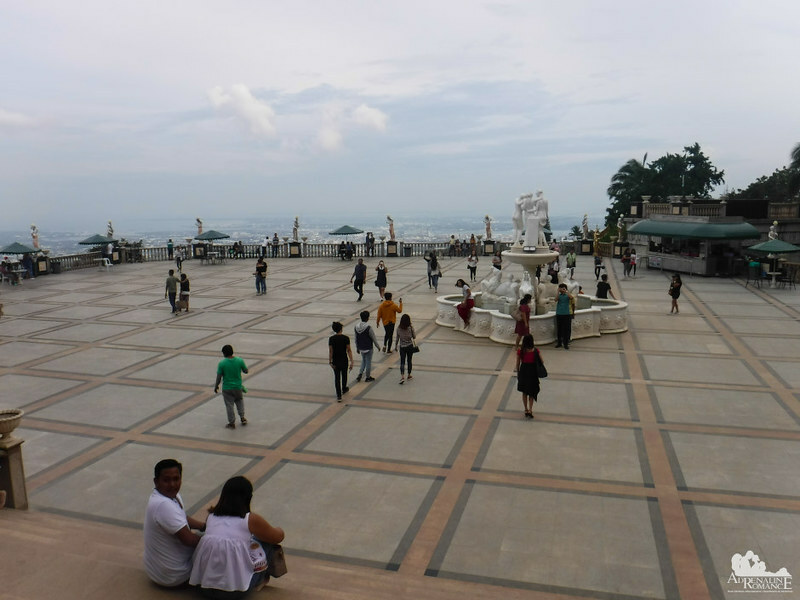 However, we do hope the Cebu government does something about the beggars who litter this beautiful place. These beggars also consistently annoy and harass tourists and locals alike, collectively making them a nuisance and a bad experience for visitors. 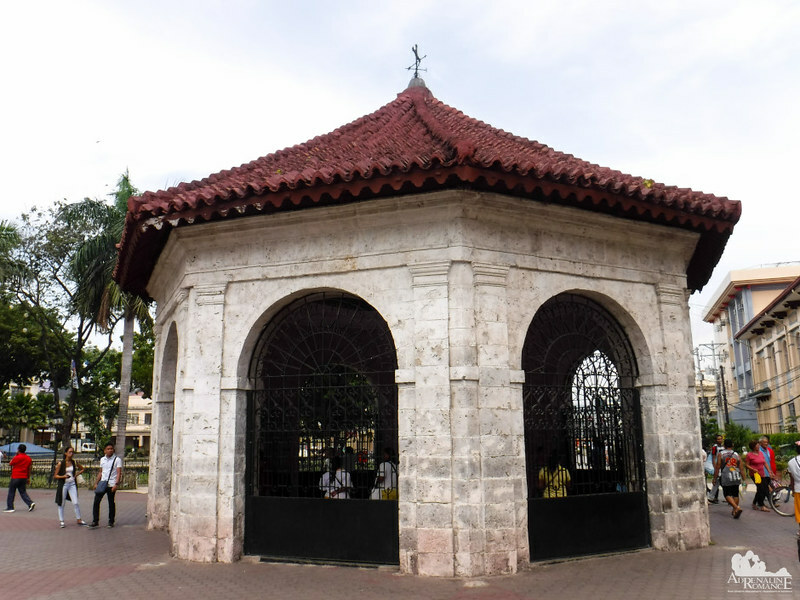 The heart of Cebu is Magellan’s Cross, which is housed in a “kiosk” made of coral stone and terracotta shingles. 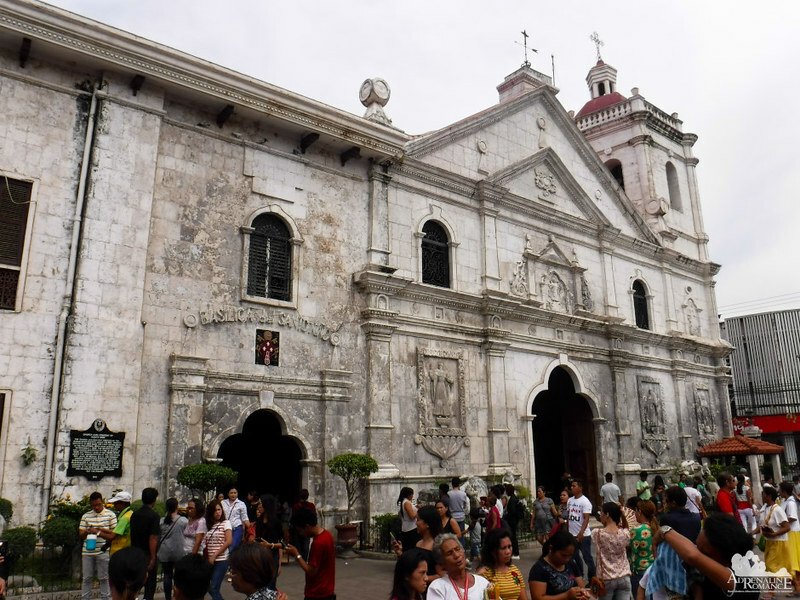 It is also considered a holy place and an important part of Cebu’s—and the entire Philippines’—history. 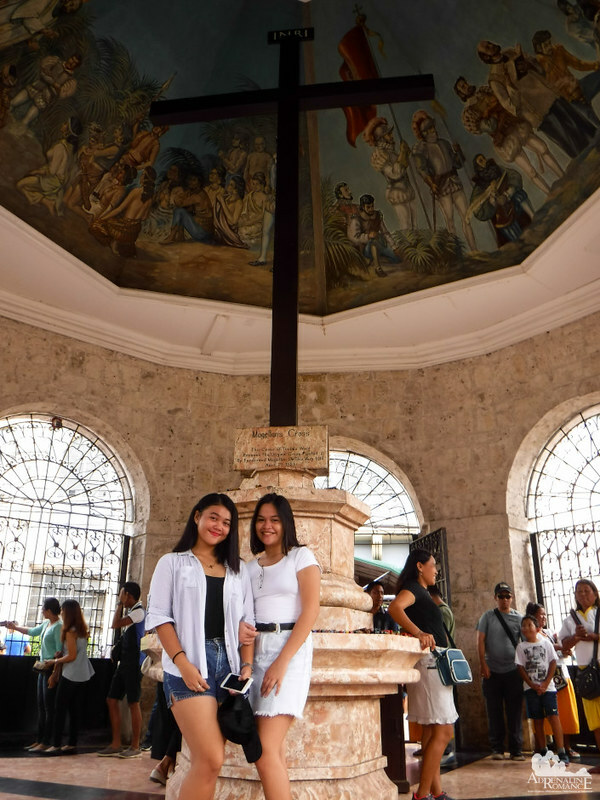 It is believed to be the very spot where Portuguese Ferdinand Magellan planted a wooden Christian cross on March 15, 1521. 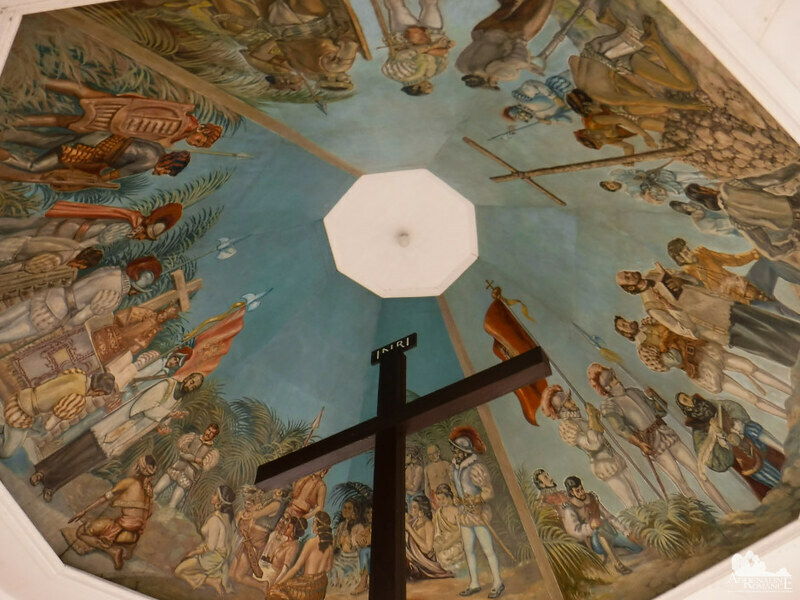 Putting up the cross and baptizing the natives signified the birth and propagation of Christianity in the Philippines. According to data mired by half-truths and half legends, natives started to chip away at the original cross, believing that bits and pieces of it harbor miraculous healing powers. To protect it from further damage, the original cross was placed in a case made of tindalo wood. However, historians believe that the original cross has long been destroyed or lost, thus making the one in its place a replica. Hundreds of prayer candles are placed on the marble pedestal that holds the cross up. 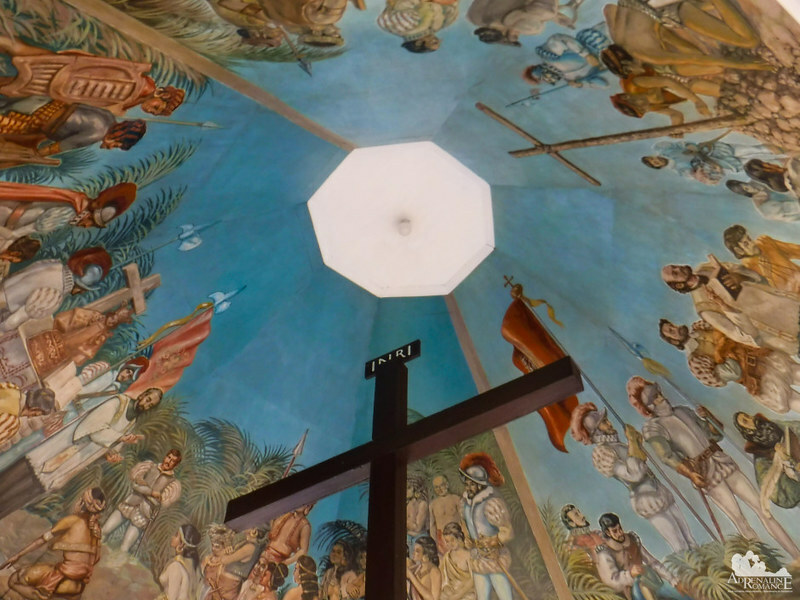 Above the cross is a nice fresco of the Magellan’s arrival and the subsequent birth of Christianity. A skylight lights the entire kiosk. Right beside Magellan’s Cross is the imposing Basilica del Santo Niño. 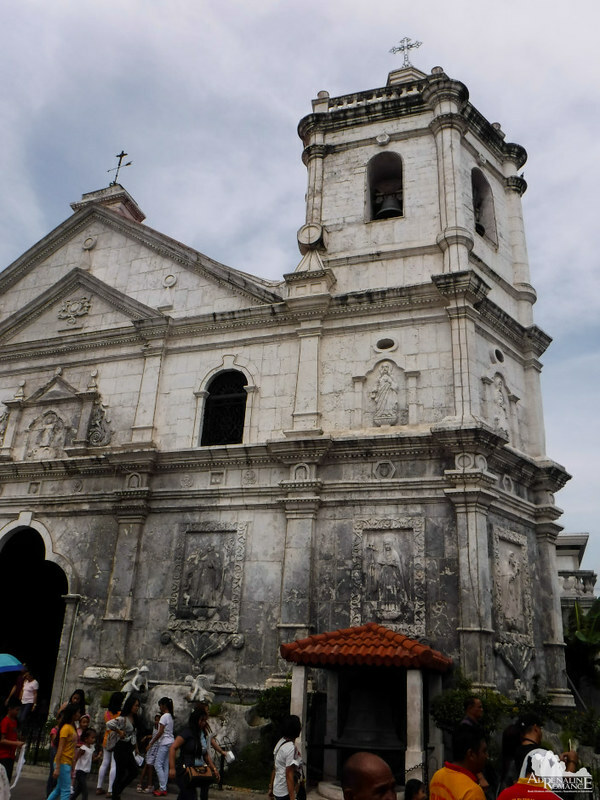 Founded in 1521 and finished in 1739, it is the oldest Roman Catholic church in the Philippines. Like many of the churches during the Spanish period, the structure is made of coral stone mortared with egg whites, mud, and hay. The Papal Legate to the Philippines His Eminence Ildebrando Cardinal Antoniutti, through the authority of Pope Paul VI, granted the church the honorific title “Basilica Minore” in 1965. 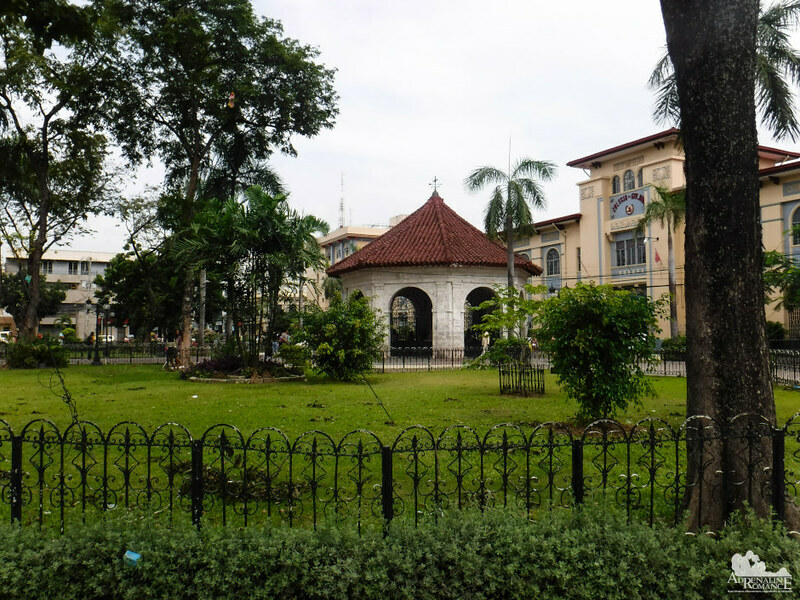 Later, President Ferdinand Marcos declared it a National Landmark. Today, the Augustinian Friars maintain and manage the grand Basilica. In 2013, an extremely strong earthquake whose epicenter was detected in the island of Bohol generated seismic waves throughout the Visayas. The 7.2 quake toppled the bell tower of the Basilica. The church itself also incurred damage. The bell tower was later reconstructed using the original stones but strengthened with steel cables. Inside the Basilica are stunning and well-preserved frescoes and valuable religious statues. At the center of the altar is the statuette of the Child Jesus—the Santo Niño de Cebu, the patron of Cebu. It is also one of the most important, popular, and beloved icons of the country. Filipinos living abroad are thrilled whenever they receive an image of Santo Niño from their loved ones. 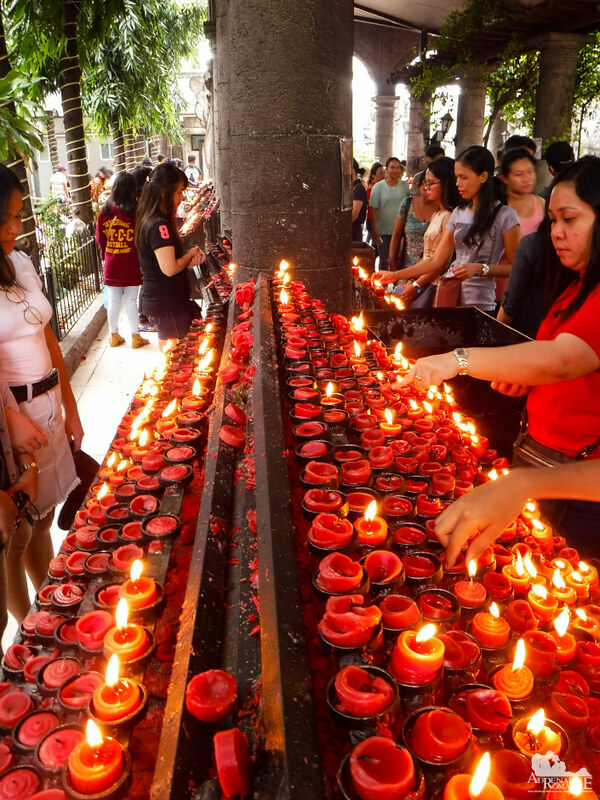 Across the Basilica’s facade is a long alcove where devotees light votive candles and pray silently. People come here to light candles during their birthdays, when they need spiritual guidance during times of stress, on times when grace is upon them, and more. It’s a place of unspoken intentions. Thousands of people visit this place every day, but silence fills the place. But outside the church, there is definitely a festive atmosphere, especially on Sundays. Hawkers peddle peanuts, cotton candy, balloons, and toys. For a few pesos, you can buy candles from old women who offer to dance in front of the church as a form of prayer. Friends come over to chat and share happenings of their lives. This “Sunday festivity” has been a never-ending tradition since the Spanish period. Our next stop was Fort San Pedro, an old Spanish military fort built under Miguel Lopez de Legazpi, the first appointed governor of the Captaincy General of the Philippines. 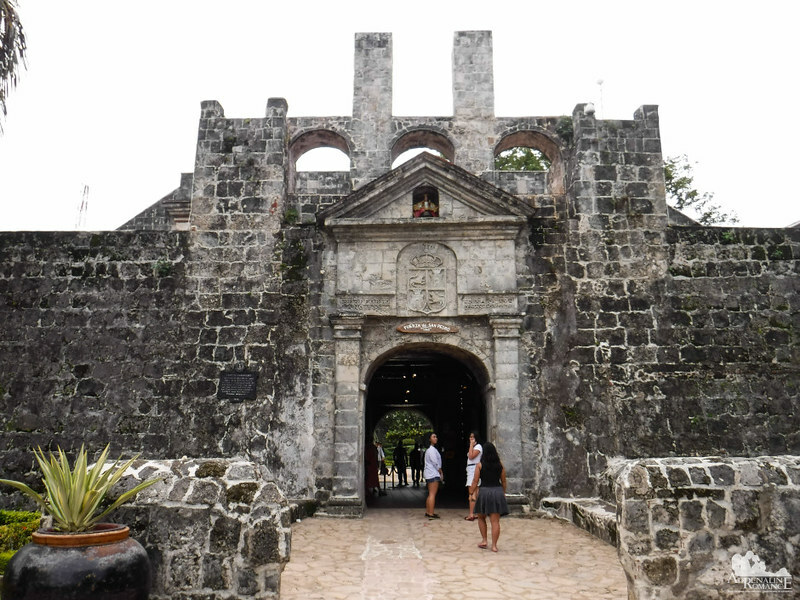 Built in 1738, it is the first Spanish settlement and the oldest bastion fort in the Philippines. 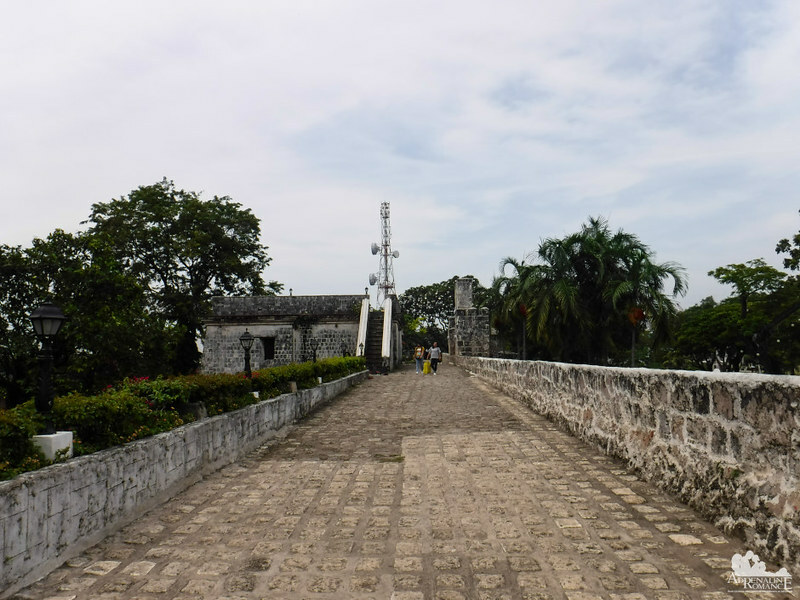 The fort, which is located near the coast, was constructed to protect the city from Muslim raiders and guerilla Cebuanos. Late 19th century during the Philippine Revolution, Filipino revolutionaries successfully attacked and reclaimed the fort for themselves. Fort San Pedro is triangular in form; two of its sides face the sea while the third faces inland. The center of the fort once housed barracks, armories, living quarters, and storerooms. It became a school during the American occupation of the Philippines, then a hospital for the wounded during World War 2. In the years after the war, the various chambers of the fort became government offices. Today, those facilities are gone. A nice courtyard surrounded by manicured gardens took over these buildings. Concerts, weddings, and other special events are often held here. Originally, the fort was made of wood. As time passed by, tougher coral stone replaced the wooden walls. The stone walls are so thick—several feet at some points. Battlements provide cover for the defenders of the fort. Today, it’s a pathway for those who want a leisurely walk while enjoying beautiful views of the surrounding Plaza Independencia. The wall is also considered a popular lover’s lane. But those thick walls almost fell in 1957—and not through a battle. In 1957, Mayor Sergio Osemeña Jr. wanted to demolish the fort to build a new city hall. The public opposed the move, and the pressure forced him to abandon the idea. The Bastion San Miguel is one of the three defensive towers at the corners of Fort San Pedro. We can just imagine the battles waged in this area as we approached the tower. The ravage of time, vandalism, and lack of maintenance almost destroyed the fort. In fact, by 1968, only two of the original towers survived. 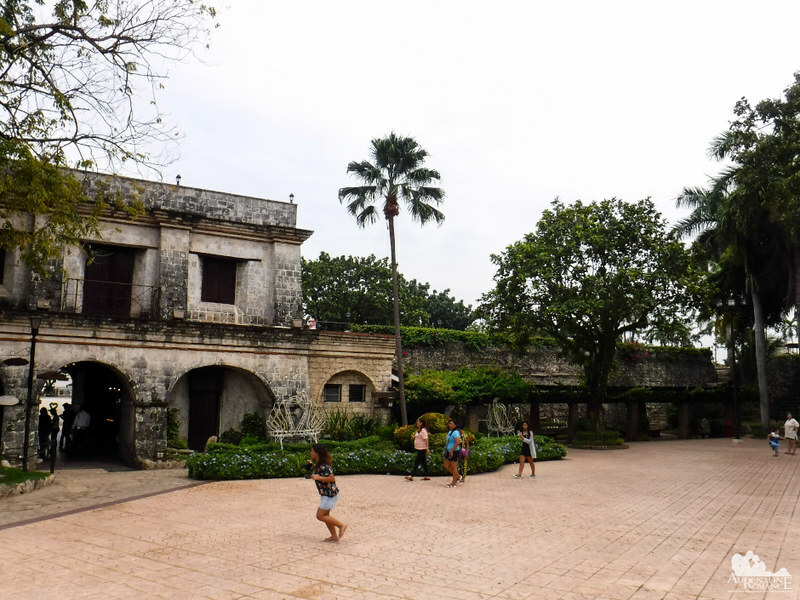 Realizing the historical and cultural importance of the fort, the Cebu government began a tedious, expensive, labor-intensive, and time-consuming restoration project. Under the guidance of architect Leonardo Concepcion, the fort was reconstructed faithfully by fort laborers. 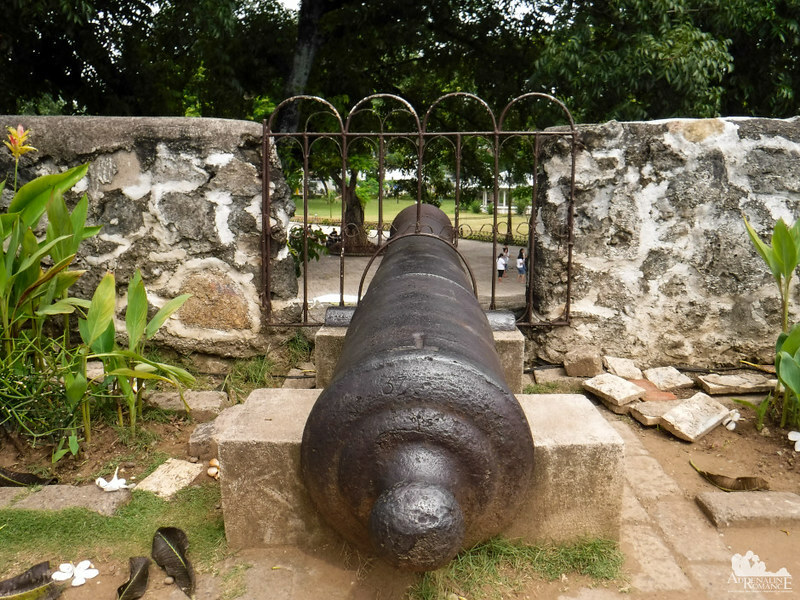 An ancient cannon points towards the shore; this gun must have scared the bejesus of invaders. Even today, it looks ready to fire! 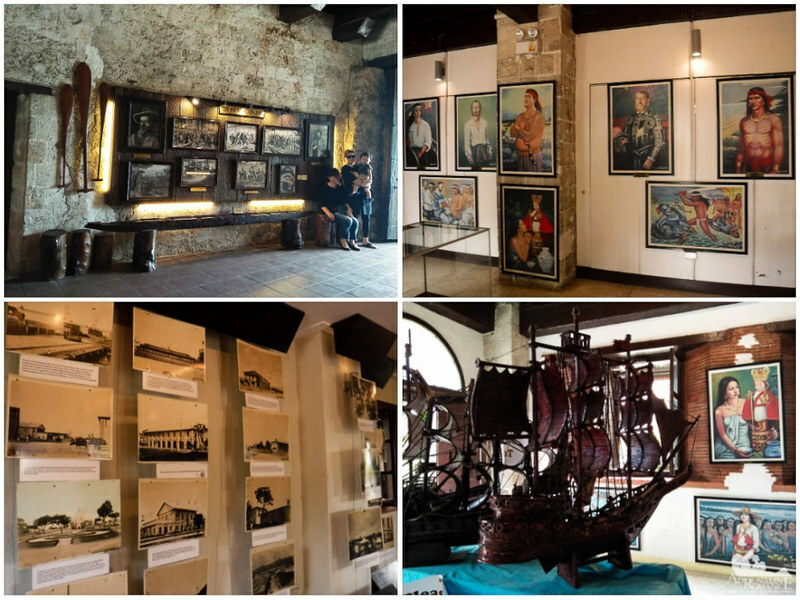 The fort also has museums that display paintings and sculptures by Cebuano artists, old photos of Cebu, and other historical artifacts. Right in front of Fort San Pedro is Plaza Independencia, the largest plaza in the city. 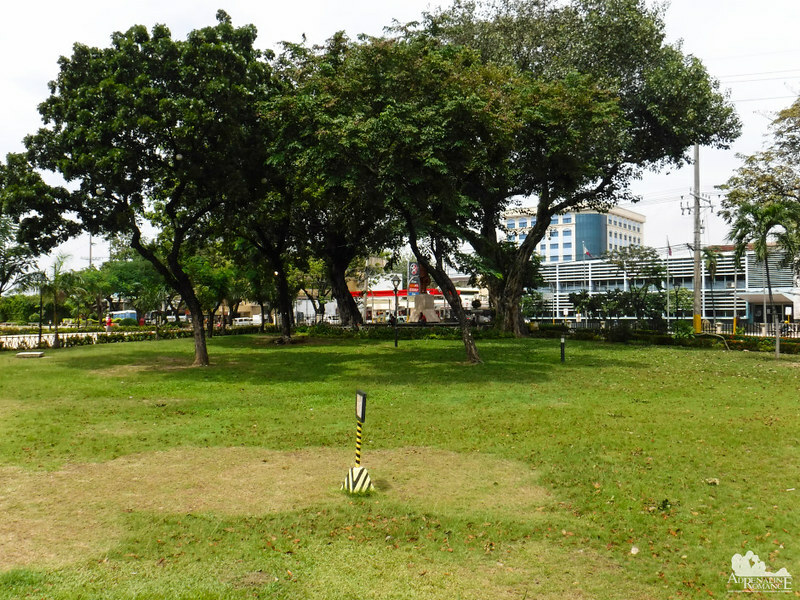 The Plaza started out as a military training and parade ground used by the nearby fort. Later it was turned into a city plaza. The greeneries and benches scattered throughout the park make it a popular meeting and dating site for young people. Rallies, concerts, and dance rehearsals are regularly held here. Plaza Independencia was partially damaged in 2006 when the government constructed a subway tunnel which runs beneath the plaza. During the construction, workers excavated pre-hispanic human bones, earthenware, and other artifacts. These priceless treasures are now displayed in various museums around Cebu. 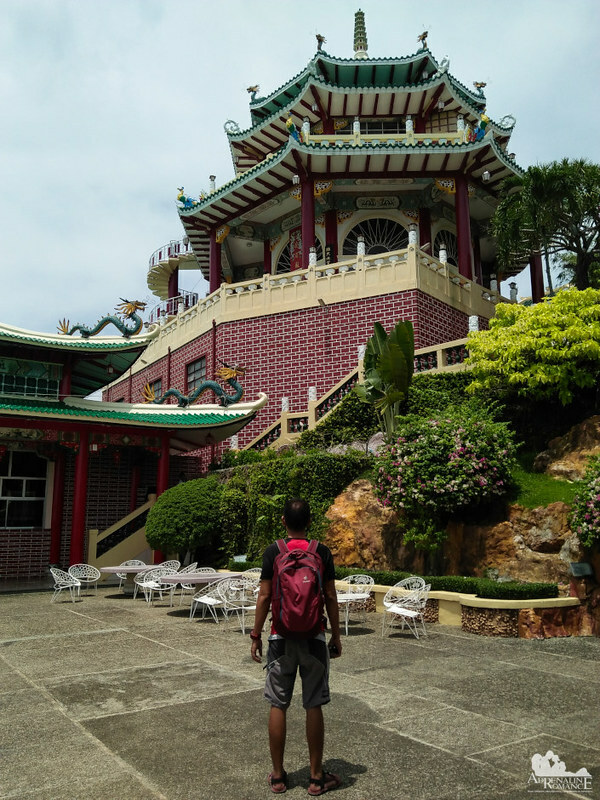 We still have some time before lunch, so we decided to visit another popular landmark right on the hills of Cebu—the Cebu Taoist Temple. The temple, which was built by the sizable and rich Chinese community in Cebu, is perched in the posh Beverly Hills Subdivision. The welcome gate looks definitely amazing, isn’t it? In fact, if you just disregard the surroundings, it would really seem that we were in China! Getting to the temple itself requires guests to climb 81 steps. These steps represent the 81 chapters of the scriptures of Taoism. For non-walkers, climbing these steep stairs is a great exercise. But don’t worry. The fresh mountain breeze that constantly blows around the area cools the body. 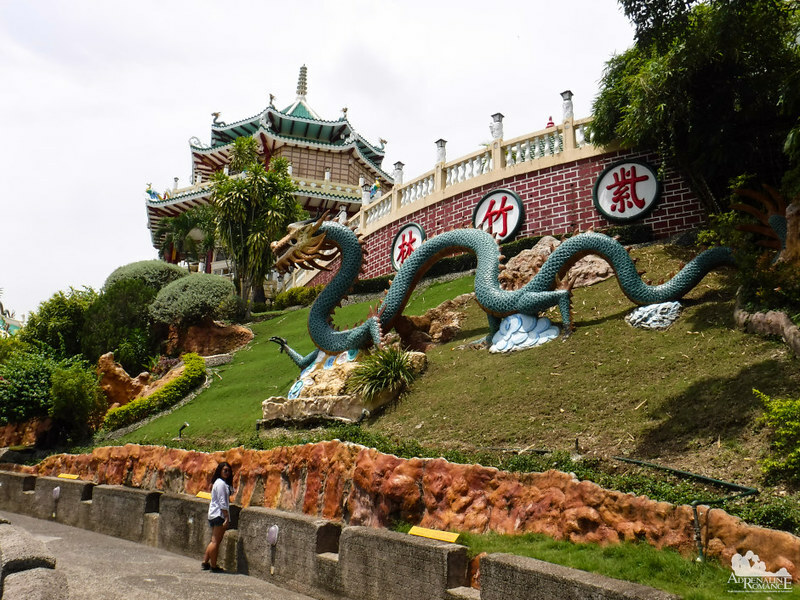 The Cebu Taoist Temple is actually composed of two temples. We’re not exactly familiar with the teachings of Taoism, but it seems the arrangement represents the “levels” of Taoist heavens. Dragons are ubiquitous creatures in Chinese culture. They are said to bring luck and fortune. 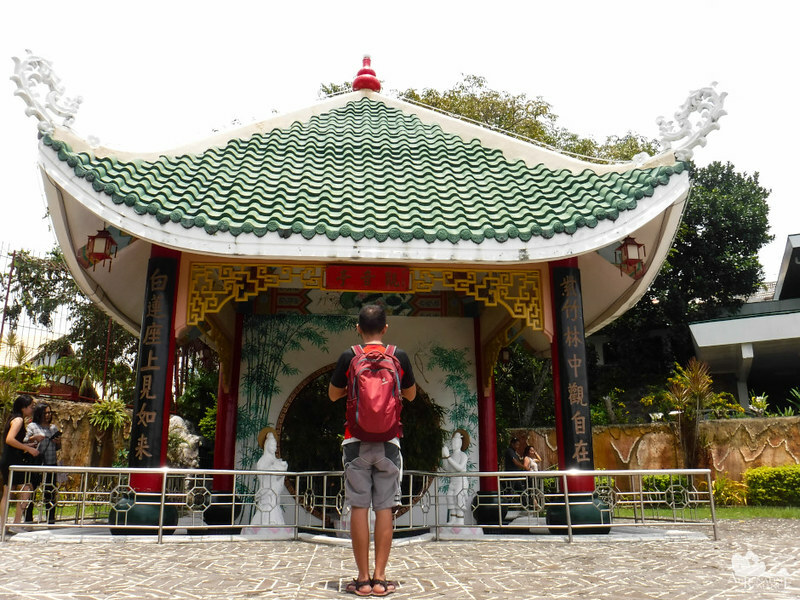 And in the beautiful gardens of the Cebu Taoist Temple, this large one really brings a lot of luck and fortune! Beautiful, isn’t it? That’s the top temple. Just check out those vibrant colors and intricate details. 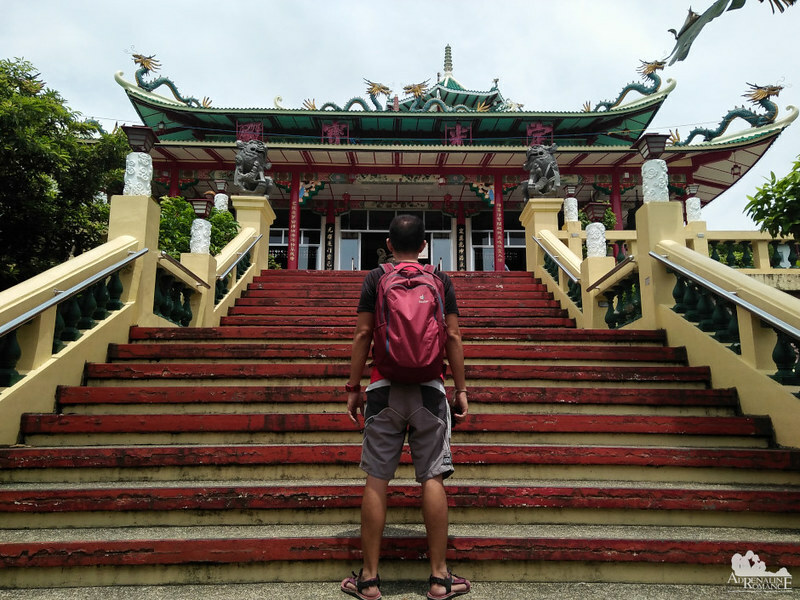 One of the nicest things about the Cebu Taoist Temple is that it is open to both Taoism worshipers and non-worshipers. The other thing we observed is that this place is incredibly peaceful and solemn, even with the influx of visitors. We aren’t exactly religious, but if we want to reconnect with our spiritual side, we’ll probably pray here. 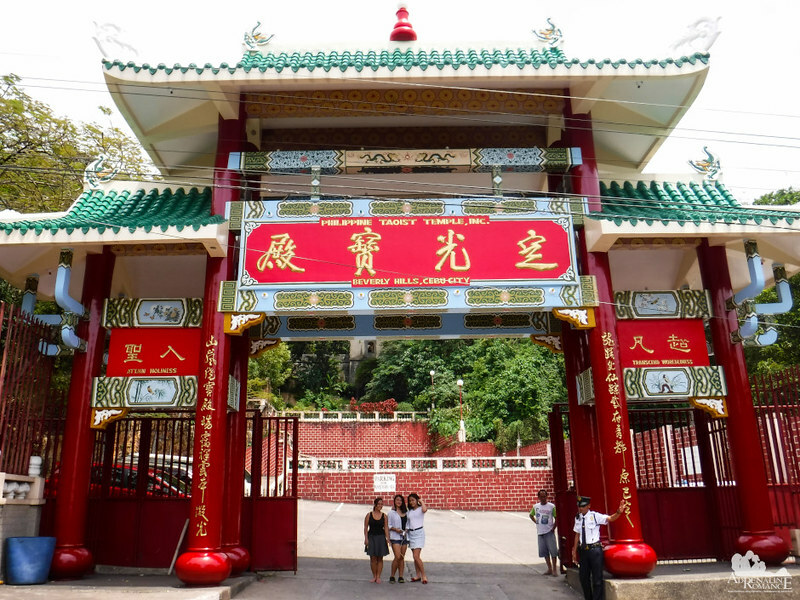 In addition to the main temple, there are various praying shrines in the Cebu Taoist Temple. Photography is strictly prohibited to preserve the holiness and sanctity of these shrines. 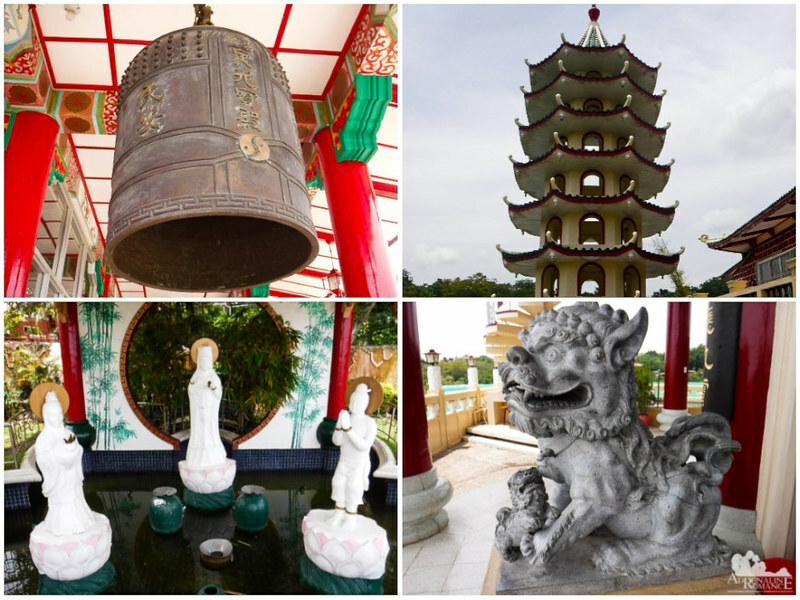 Many Chinese artifacts such as statues of deities, luck lions, dragons, and bells can be seen all around the temple. There’s also a cool pagoda at the lower temple. Buddhist literature during the Han Dynasty suggests that pagodas were tombs of important people. After lunch, we proceeded to Balamban and visited Buwakan ni Alejandra, a new attraction which recently opened in 2017. 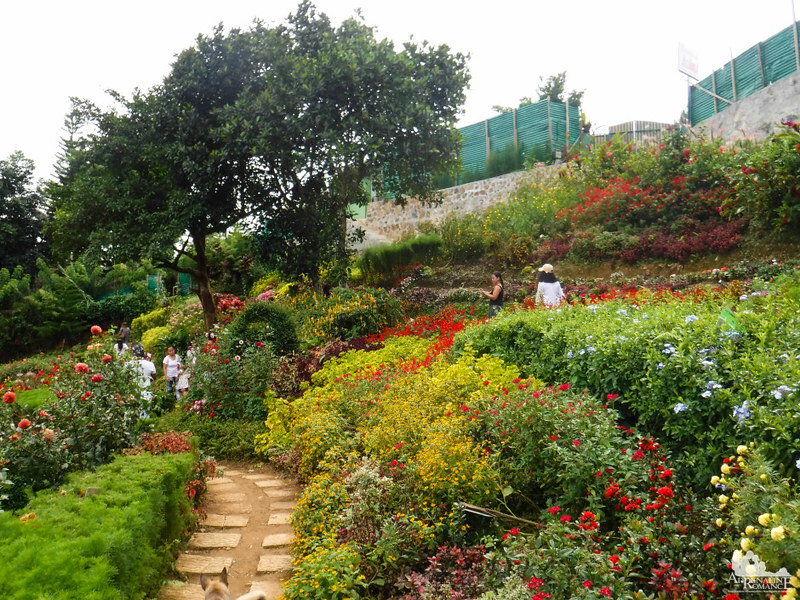 We were overwhelmed by the myriad of beautiful colors as we entered the garden. Brick footpaths weave in and out of the garden. More importantly, they prevent visitors from trampling on the delicate flowers. Topiaries and metal trellises are also scattered around the Eden-like garden; they are popular spots for selfies and taking photos. Flowers and plants are identified and labeled with these signages. Beautiful to see, sweet to smell, an awe to behold. But don’t pluck them or pull their petals out. Flowers are delicate, so keep a bit of distance and respect nature. 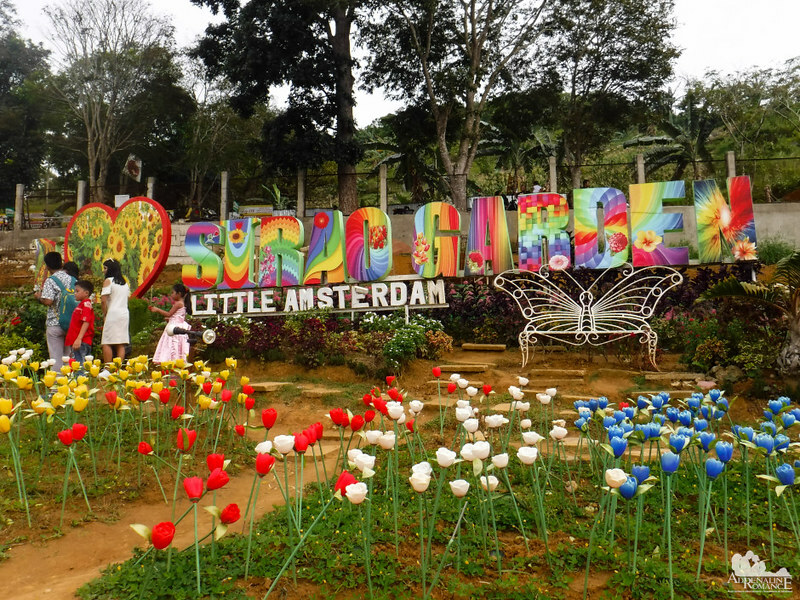 On the way back to the city, we stopped by Sirao Garden, colloquially called Little Amsterdam by their owners (we wonder why Filipinos are so fond of referencing our own unique attractions to other places). 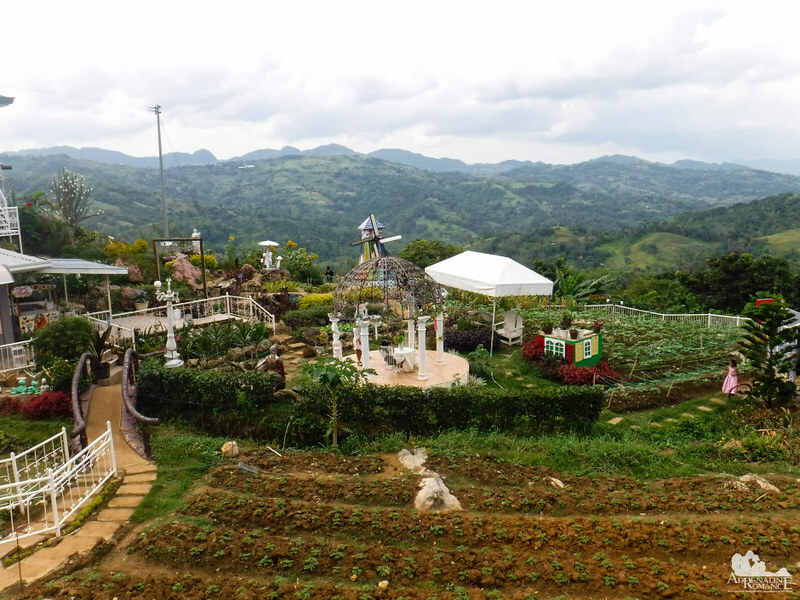 The place sits right on a slanting mountain slope that overlooks the barangay of Sirao. 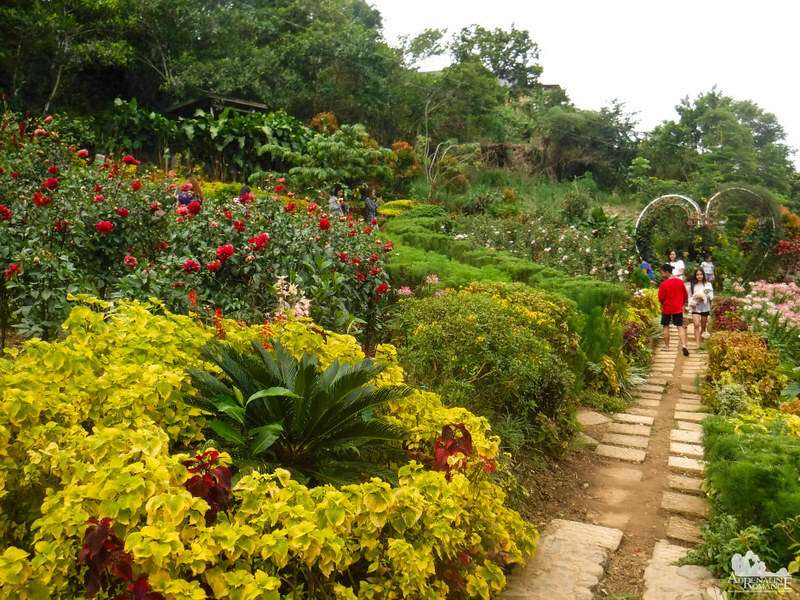 In addition to the flower gardens, Sirao Garden has a cafe and a children’s play area. During weekends, the number of people swells as buses, vans, cars, and motorcycles disgorge loads of tourists. Gazebos, cottages, trellises, and replicas of European windmills dot the entirety of the farm. 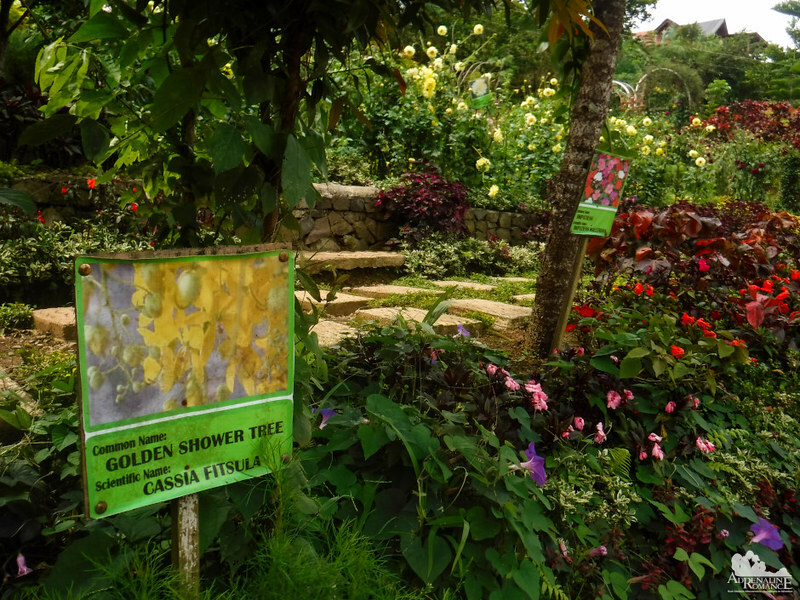 Unlike Buwakan ni Alejandra which is originally and specifically designed for tourists, Sirao Garden is actually a functional flower farm. 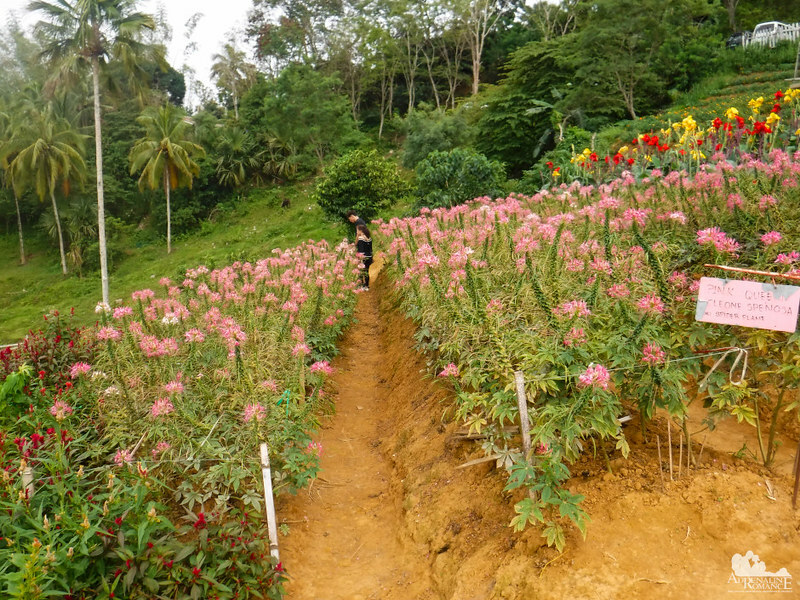 In fact, the owners are ordinary local farmers who grew tulips, daffodils, hyacinths, sunflowers, and other blossoms that were harvested and sold to the lowlands. Then at one point in time, people who passed by the farm started taking photos of the flower fields and posted them on social media. The Internet exploded, piquing the interest of the public. The owners, realizing the tourism potential of the farm, decided to allow visitors to come in and enjoy their farm. Be careful when touring the flower farm. In some places, there are no concrete or brick pathways, just muddy footpaths that criss-cross the farm. It is very likely that guests may trample some flowers due to the lack of brick/concrete pathways. 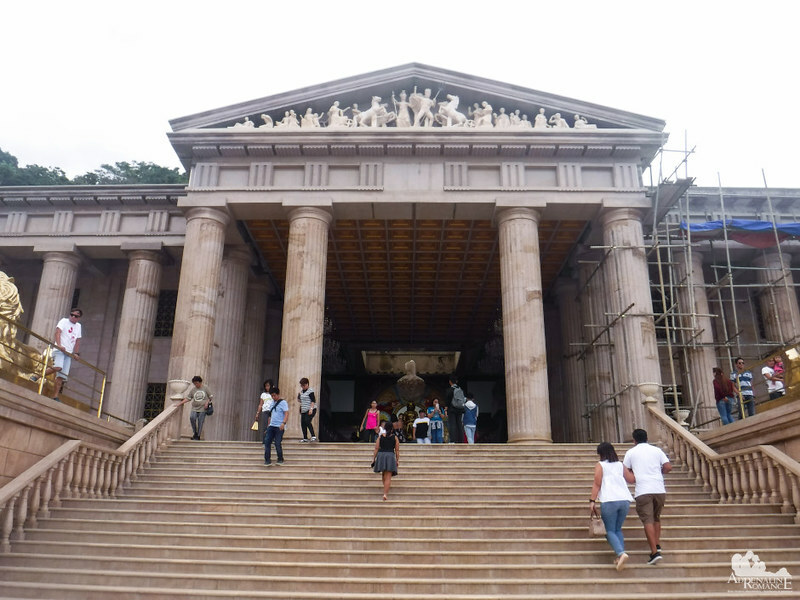 Our last stop was the Temple of Leah in Busay, a shrine and museum that is still under construction. Stepping into the place makes us feel that we were in Athens, Greece. It’s not difficult to explain why we felt that way. Everything here, from the courtyard fountain to the statues that line up the place is Greek/Roman inspired. The courtyard overlooks the Cebu metropolis. At night, the glittering city must be an awesome sight. The main building looks similar to the Parthenon in Greece. Featuring many Doric columns, the design is based on ancient Greek/Roman architecture. Greek and Roman statues adorn the different areas of the building. 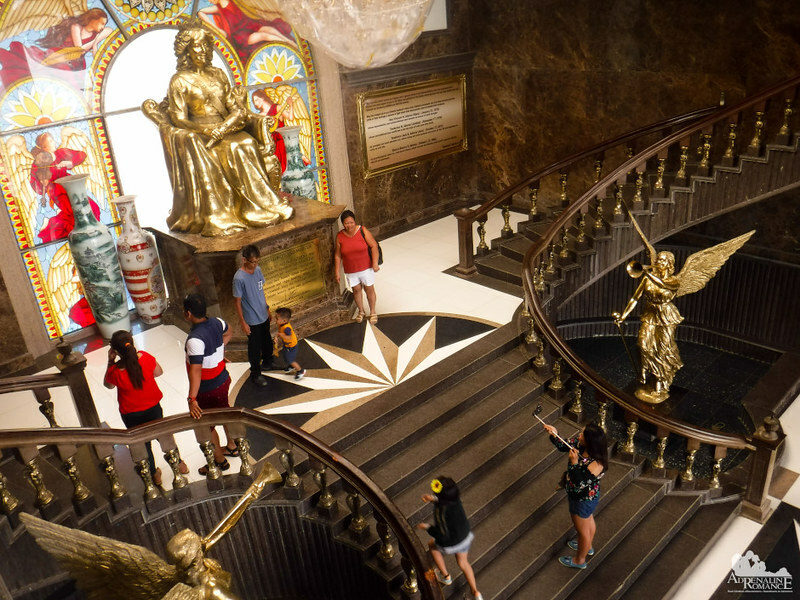 The centerpiece of the building’s foyer is a 9-foot brass sculpture of Mrs. Leah Villa Albino-Adarna, the late wife of Teodorico Soriano Adarna. The Adarna clan is an entrepreneurial family who owns a popular and successful hotel chain. The Temple of Leah is an inspired brainchild of Teodorico. A plaque on the statue explains that the Temple of Leah is actually a shrine and museum lovingly dedicated to Leah. Doesn’t this sound similar to the Taj Mahal in India? At first, we wondered what Temple of Leah is all about. But as we went around the structure, peeking at dusty rooms through the grated windows, we finally understood what the facility is. The Temple of Leah is a museum that houses Leah’s collections of statues, figurines, jars, books, and other artifacts she acquired during her travels. You see, Leah has always been an avid collector of rare items when she was still alive. Teh construction of the Temple must now be on its final phases since the precious artifacts are now pre-positioned in their rooms. We are quite excited about this. We have always been interested in books (we have our own library at home) and rare artifacts. As you can see, Cebu is not just a vibrant, lively, and economically booming metropolis. It’s not just a city choked in traffic, noise, and pollution. 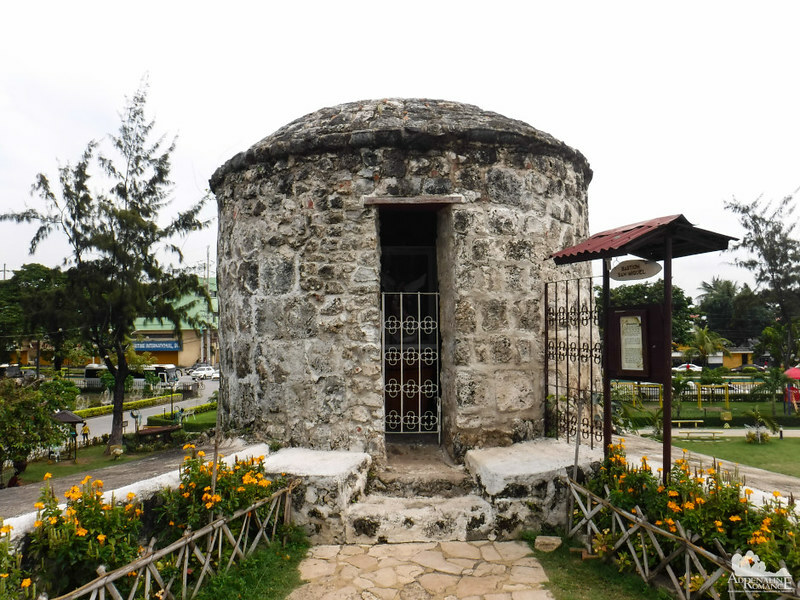 Cebu is a bastion of national history, heritage, and culture. We have precious and timeless heirlooms that speak a lot about us. When you tour around the city and visit its museums and attractions, you are actually learning about us, the gentle and proud Cebuanos. 1. 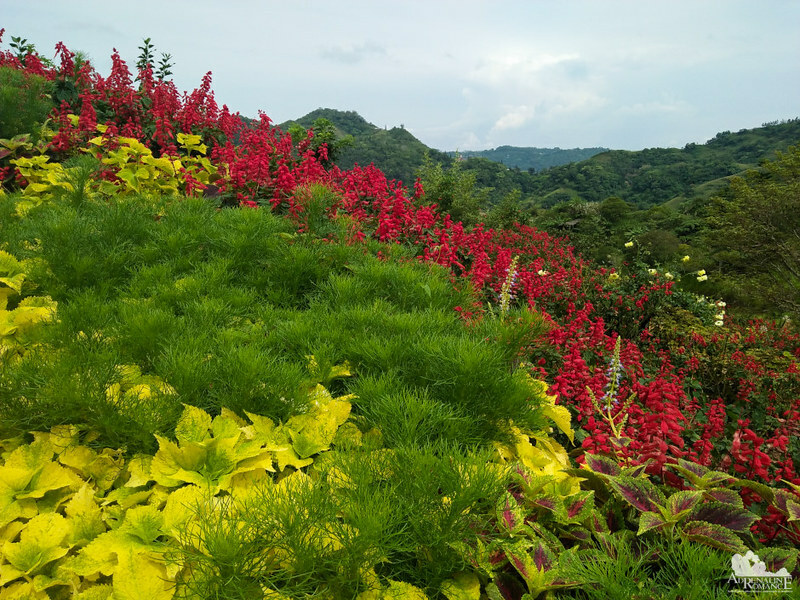 For a comprehensive, memorable, and enjoyable Cebu City Tour, get in touch with Travel Cebu. 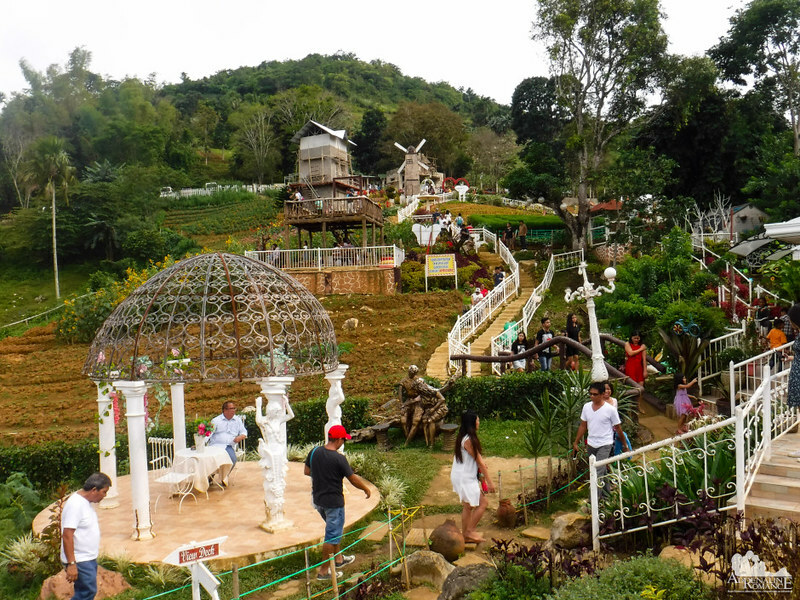 They offer various tour and adventure packages around the entire island of Cebu. Check out their website or contact them for more details. 2. For a more comprehensive tour than the one we had, we suggest you do your tour on a weekday (i.e. Monday to Friday). That’s because some museums and attractions, which are included in the package, are closed during weekends. 4. Mind your trash. Do not litter. 5. Observe proper etiquette, especially when entering sacred or holy places. Don’t wear revealing clothes, vandalize the area, or touch delicate items. Keep your voice down, and avoid unruly behavior. Follow the rules as implemented by the facility or attraction you’re visiting. 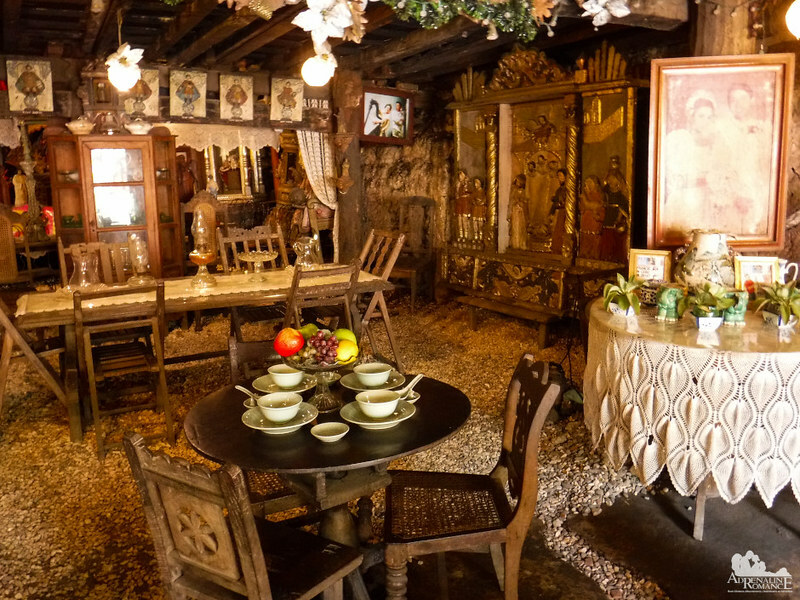 Cebu looks like a fascinating place to escape the crazy city life and unwind and learn about the history especially the ancestoral house. Hi Esther! It is a great city, but the traffic here is horrendous.